Are you in need of a shop refurbishment or refit? Here at Hampshire Mezzanine Floors, we fully understand the importance of making that all important first impression on your customers. After years of working with retailers to create and spruce up shops and stores for better customer experiences, we have become experts at executing high-quality shop refits. If you are looking to make better use of your retail space, we are on hand with innovative and cost-effective solutions that will maximise your sales area and optimise floor space. A great way to make the most of your current retail space is to add a mezzanine floor to your current premises. Rather than moving to a new location at considerable cost and stress, speak to HMF about maximising your floor space. A mezzanine floor could be the missing piece to your retail puzzle, creating new areas to shop or dine. From an empty building, we can also provide a total fit-out of a complete store, ensuring that we cover all elements of the project from start to completion. 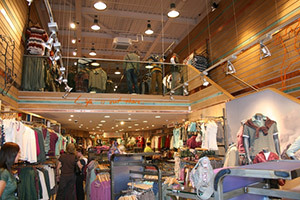 Partitioning allows you to create separate spaces within your retail environment. Perhaps you need a stockroom, tea room or even a consultancy area? Our range includes fixed partitioning, relocatable partitioning, glazed partitioning and acoustic sliding and folding walls. You can discover more here. For any refurb project, it is important that you select a suitable flooring option that stands up to the wear and tear of everyday business use. 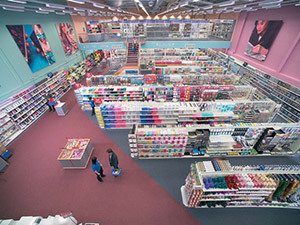 We have a selection of carpets, vinyl flooring, ceramic tiles and many more for you to choose from. We can also fit raised access flooring if that is an option that you are considering. Read more about our flooring options here. Our electricians, who are NIC EIC Approved Contractors are able to provide a range of lighting installations and services for your retail space. We provide the full package, including lighting design and lux level calculations through to lighting installation, test and commissioning. We also provide emergency lighting, which is a must for all businesses. We will provide up-to-date installations that comply with all building regulations and standards. Find out more or request a quote here. If you are looking to opt for a mezzanine floor, we have a great variety of stair and lift options available. We have a selection of stair and lift options so that you can pick the best option for your retail needs. This is essential for the majority of businesses. You may have existing toilet facilities in need of a refurb or perhaps looking to develop and install a new facility. HMF take care of the power supplies and plumbing, as well as supplying toilet cubicle, urinals, vanity units, hand dryers, mirrors, flooring, grab rails and disabled toilet alarm systems. We will always ensure that your facilities design complies with regulations. We have all of the skills and equipment required to create a retail space that supports the needs of your business. However, if you want to display your products, HMF has a range of retail Gondola shelving displays, as well as slatwall panels and feature displays. As well as serving practically, it is also important that your retail space gives a good first impression visually. We can design a range of bespoke graphics and designs for visual and inspirational effect. For those busier days, it’s important that you manage the check out process in an effort to avoid negative impacts on sales. Explore a range of queuing systems, including post, pole, rope and retractable pedestrian barriers. HMF counters are available in a variety of sizes and display options. Counter systems can also provide useful storage solutions as well as display opportunities. The front of your shop forms the first impression for many customers visiting your store. We have a range of door options available to choose from, including automatic bi-parting sliding doors, manual single and double powder coated aluminium entrance doors. Provide your retail space with the finishing touches and opt for some modern and stylish furnishings. Whether you need reception furniture, desks, workstations, seating and screens, we have a variety of furnishing options for you to choose from. We also have a range of furniture to provide your employees with comfortable breakout and canteen areas. Hampshire Mezzanine Flooring can also provide you with all of your storage needs for your retail space. From Storage bins, boxes and units to leisure and cloakroom equipment and shelving and pallet racking. Discover more here. Hampshire Mezzanine Floors can provide a wide range of lifts including passenger lifts, goods lifts and DDA compliant platform lifts. If you require building works, anything from window installation to complete building extensions, we are able to provide this to a high-quality finish standard. Request a quote or find out more. As part of your project, we will ensure that you are equipped with the correct mechanical installation for your retail space. This includes air conditioning, ventilation, heating systems, plumbing and sprinkler installations. Not only will we install this equipment, but we also provide maintenance. HMF will take care of your power needs within your new retail environment. We have plenty of options to provide discreet and neat power to your retail space. We can also install Cat 5E points for telephones and computer systems and manage network cabling. Find out more here. It is essential that your retail space meets the requirements of Building Control and Fire Officers legislation. It is essential that you have effective, working fire alarm systems in place to protect the safety of your customers and employees. We will design a system that best suits your business needs and uses, which is then approved by Building Control. We will work with you from start to finish to ensure that you have effective systems and in place. Find out more here. As with fire alarm systems, emergency lighting is a must. All of HMF’s installations are up to date with current building regulations. We use leading brands including Rockwool, Isowool, British Gypsum and Knauf to install both insulation and fire barrier requirements. Curtain walling fire stops are also available. More information is available here. We know that protecting your business is important to you. HMF has a selection of security options available including burglar alarms, CCTV, access control systems, retail security tagging systems, security fencing and security shutters. A fully supportive service, from start to finish. We will help you to get the most out of your current space by providing computer-aided, state-of-the-art CAD drawings to help you choose the best solution at a reasonable cost. We provide only the highest quality finish, which is thanks to the skilled trade persons that we work with to complete the job. Many projects require Building Control Regulations and possibly Planning Approval. Hampshire Mezzanine Floors administrate all your Building Control Regulation and Planning Applications on your behalf saving you valuable administration time. When it comes to planning a project, Hampshire Mezzanine Floors provide a clear and concise schedule of works detailing the start and completion dates. All work undertaken is project managed by our project team, and each floor conforms to BRE Digest 437, relevant British standards, and the latest Building Regulations. We also have a comprehensive insurance policy in place, with £5,000,000 Contractors’ All Risk policy insurance. This large amount of cover provides you with complete peace of mind. As well as accreditation with the British Standards Institute to ISO 9001:2008 so that Hampshire Mezzanine Floor can provide and maintain a consistently high standard of work in all tasks undertaken. If you’re interested in exploring options for a new retail mezzanine floor or shop refits, get in contact today. You can give us a call, or request a quote.